What’s so neat about the waste management industry is its blend of the old — packaging and water bottles — and the aspirational — government rules that require plastic bottles be recycled as, plastic bottles. Or nylon carpet reincarnated as more nylon carpet. It’s a circular use of materials that can smartly limit the endless extraction of resources, like natural gas and oil, while also creating economic benefits for businesses that give their products new life. If only these were the current standards, here in Ontario. Without strong rules to keep producers focused on high-end recycling, it can all go downhill, literally, into landfill. Unfortunately for citizens who dutifully wash and sort their blue bin recyclables, that is often Toronto’s experience. As a result, 28 per cent of the 165,000 tonnes collected in residential blue bins last year ended up in landfill, a mix of paper destroyed by mayonnaise or ketchup left in recyclable jars or black plastics that Toronto doesn’t currently recycle. That’s a shame for the environment, not to mention the loss of lucrative business opportunities. On Monday, Toronto council is scheduled to vote on moving forward with a plan to seek solutions for the contamination: food, single-use plastics and blue-bin interlopers like clothing, that get twisted in machinery. Council should vote to create a new plan. But moving forward with its development, the city must adopt solutions based on wisdom and facts. We don’t need a series of knee-jerk product bans but future-looking policies. The city needs to move towards the best of what’s possible in recycling, not just the easiest. That means listening to industry ideas for innovation and to environmentalists, who’ve watched other jurisdictions successfully adopt intelligent plans. As Emily Alfred of the Toronto Environmental Alliance says, it’s best to avoid rash recycling decisions or outright product bans. Most bans result in exemptions anyway, such as plastic drinking straws allowed for use by hospitals and people with disabilities. Alfred’s organization is rightly pushing Toronto to examine the merits of new programs in American cities, such as deposit-return options on take-out food containers. Another suggestion requires companies to take back their packaging — which is exactly the type of thing envisioned by the Waste Free Ontario Act. That legislation, now in political limbo, was created by the previous Liberal government, to drive “extended producer responsibility.” That’s something that governments in Canada have long talked about but still struggle to move forward with. The Ontario legislation would force producers to take responsibility for the items they make — including packaging. It took years of consultation to get it passed and the transition of some programs, like tire recycling, is already underway. But, crucially, the blue bin changes were not implemented before the election. Now, it falls to the new Progressive Conservative government to help cities like Toronto by paying attention to the business of recycling. After all, forcing producers to recycle their own products, would remove substantial costs from the taxpayer. 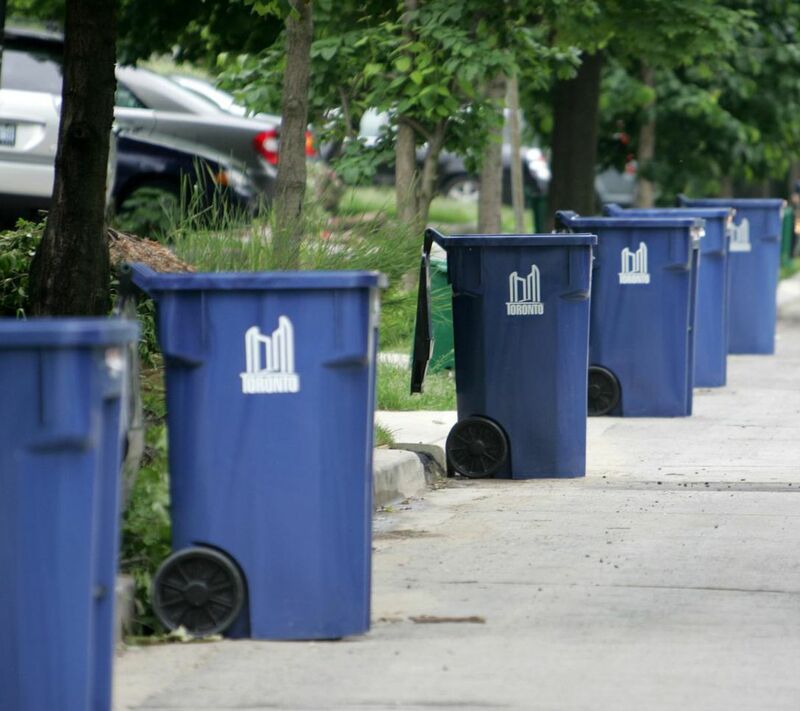 In 2017, the net costs for Toronto’s blue bin recycling was $30 million. Imagine saving Torontonians that much money. Now that’s respect for the taxpayer. By moving forward with the legislation, Ontario would force the private sector to innovate. Experts say the “circular economy” that transforms the old into new, will create businesses and jobs — a winning combination that deserves support. It’s not at all clear that Ontario’s freshly-named Ministry of the Environment, Conservation and Parks sees that. One might conclude that Toronto taxpayers will have to continue to pay to pick up after producers. So far, Toronto has been trying to educate the public with an ad campaign on what belongs in blue bins. Still, confused or uninterested residents continue to contaminate recycling materials — commodities with a market value — by tossing in food and clothing. These are serious problems that downgrade the value of recyclables. But council must also find a way to deal with the new items that come along, such as the ubiquitous black plastics now widely used by grocery stores. While the technology exists to sort black plastic, the city says its volumes are so high that it must be sorted manually, instead of mechanically, which is not cost effective. These plastics — along with whatever gets invented next — must be part of the discussion. Until the Ontario government announces how it plans to deal with extended producer responsibility, Toronto must plot its own recycling future. The report on exactly how that will be done is expected in the fall but the city must ensure it takes the time to get it right. Haste makes, well, more trips to the landfill.